Principal Cast : Meryl Streep, Emily Blunt, James Corden, Anna Kendrick, Chris Pine, Tracy Ullman, Christine Baranski, Johnny Depp, Lilla Crawford, Daniel Huttlestone, MacKenzie Mauzy, Billy Magnussen, Tammy Blanchard, Lucy Punch, Annette Crosbie, Joanna Riding. Synopsis: Musical film appropriating the fairy tales of Cinderella, Rapunzel, Red Riding Hood and Jack & The Beanstalk, a childless couple venture into a darkened wood to locate items a witch needs to lift a curse upon their family. What we think : Somewhere through translating this stage musical to the screen, something got lost in the woods. While it’s handsomely mounted, Into The Woods feels a little flat. And for a Disney film, it’s definitely dark. The songs are good, the acting is great, but there’s a missing soul here that mitigates all the money up on the screen. So I’m not a fan of Stephen Sondheim. Not through some kind of hatred, though: I just haven’t had that much exposure to his work. I know who he is, and I can testify that his career stands as one of the greatest ever in musical theater, but I’ve not had the pleasure of experiencing a lot of his material. 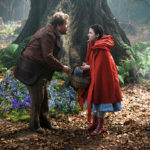 Into The Woods is a Sondheim work, albeit co-scribed with writing partner James Lapine (who wrote the screenplay here), and if nothing else, you know the film has his seal of approval because he worked with the actors in their respective roles to sign off on not only the production’s story changes (apparently there’s a few) but also its musical cues. Disney’s all-star cast – including Meryl Streep and the currently white-hot Emily Blunt – are gifted Sondheim’s lyrics in Rob Marhsall’s high-falutin’ film adaption of the original stage musical, but do they make the most of them? Does Marshall conjure a film to match his Oscar-winning Chicago, or does Into The Woods struggle to see the woods for the… er, trees? First things first: Anna Kendrick as Cinderella? Not the casting I’d have had, but Kendrick makes a great fist of things in a role I felt under-served her ability as a singer (what, you didn’t catch Pitch Perfect? You really should have!). 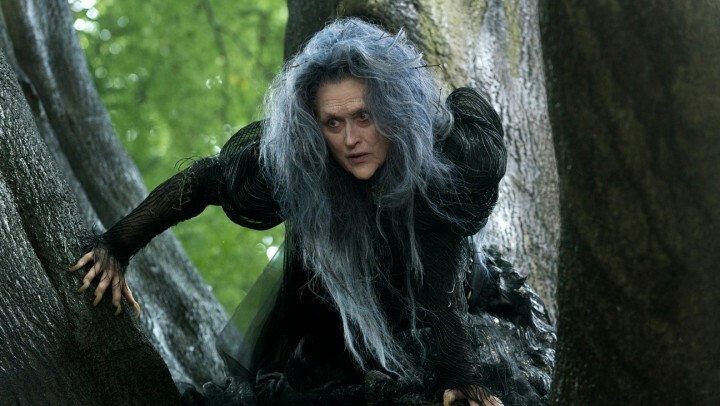 Meryl Streep snagged an Oscar nomination for her role as the wicked witch, a nomination thoroughly undeserved. Yeah, I went there. I went against The Streep. James Corden and Emily Blunt actually make a lovely couple, even though Corden’s batting well above his average, outclassed by his fellow performers almost the entire film. Seeing Tracy Ullman, even in a minor role as Jack’s mother, is always pleasing. Chris Pine’s a Prince (Charming) for Cinderella, and he seems to be having an absolute blast with roles these days (he’s gut-bustingly hilarious in Stretch), and this one ain’t much different. Pine’s duet with Billy Magnussen, as two prince’s proclaiming their frustrations for their princesses, is probably the funniest part of the whole film. 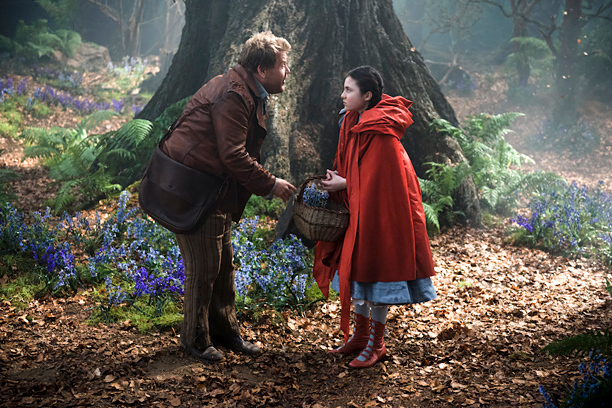 Then there’s the abrasive Lilla Crawford as Red Riding Hood. She’s annoying as all hell, but Crawford does a great job in the iconic role. At least she’s better than Anne Hathaway’s obnoxiously inane voice-work in Hoodwinked. And Johnny Depp…. well, Depp is used to crazy roles like this, with an abundance of make-up and symbolism, but seeing him playing The Big Bad Wolf doesn’t have the same impact these days. After all, he’s been all manner of fairy tale characters. Poor guy – he’s become a near-parody of himself since taking on the role of that ubiquitous pirate. Into The Woods is a pastiche of the Grimm Brothers fairy stories. A young couple, Blunt and Corden, are struggling to have a child, and learn through their neighbor, the Witch (Streep) that years earlier a curse was placed on their house which would forever make them childless. The witch takes pity on the couple, telling them they must collect four items for a potion which will reverse the curse: a cow as white as milk (Jack & The Beanstalk), a slipper as pure as gold (Cinderella), hair as yellow as corn (Rapunzel) and a cape as red as blood (Riding Hood). The couple venture into the woods, running across each of their intended targets to procure the ingredients to their childless salvation. Whereas most of these stories have been given the humorous take (Shrek) and on television the dramatic (Once Upon A Time), here they’re planted firmly in the musical province. Rob Marshall gives the story the breadth of scale and production value you only get with film. 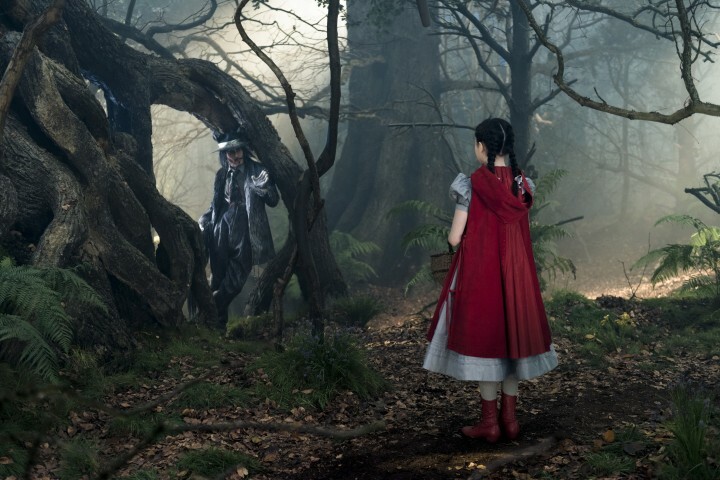 The color, texture and design of the film is brilliant, the cinematography stands out with its richness and layered detailing: in short, Into The Woods looks fantastic. The actors perform their roles with panache, even though I don’t think the film works as a musical. I know, the film is based on a stage musical, but in translating the music to the screen in such literal context, with almost constant singing of dialogue (something Les Miserables did remarkably well) between its period-fantasy tones, it just rang hollow. Rob Marshall’s stylish direction notwithstanding, the story didn’t jibe on the screen as I’ve no doubt it does on the stage. It all just felt empty to me. Perhaps I’m not an aficionado of Sondheim looking at this all wrong, but a film should first and foremost be entertaining. 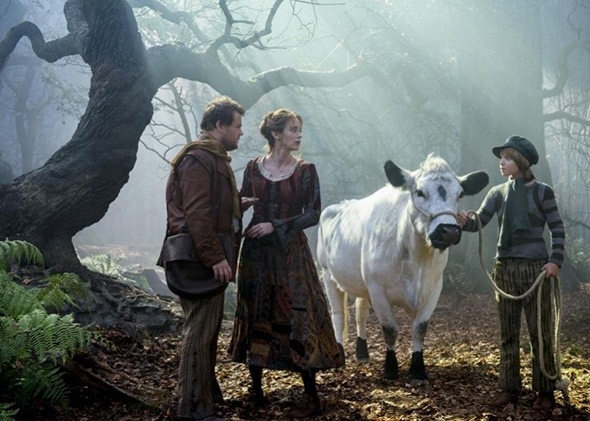 Into The Woods is entertaining in fits and spurts, but not as a whole, which is disappointing. I guess it’s the meshing of two allegorical styles, musical and fantasy, that didn’t work for me. The cast gamely go for it, so they’re okay, and Marshall’s direction is technically competent and hardly dire, but there’s a sense of “huh?” about it all. It failed to resonate with me. I can see why Sondheim is regarded as one of the great lyricists of all time, but Marshall isn’t up to the task of delivering a film worthy of such a talent. It’s there, passably, but all the singing, dancing, prancing activity in this film was unflattering to the wonderful words.